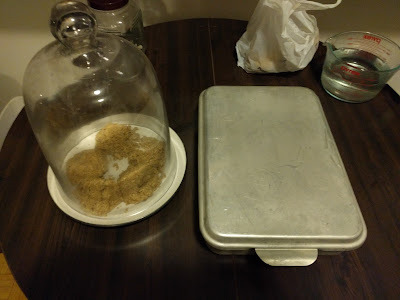 Last week, I started making yeast cakes, which I will hopefully use as a starter culture for future wines. 至七日開，當處翻之，還令泥戶。At dawn on the seventh day, at the appropriate time flip them over, and once again seal the door. I didn't remember to flip the cakes at sunrise, but I did flip them this evening. These are how I've been storing the cakes, in my closet at about room temperature. It's no thatched-roof hut, but it will have to do. The cakes are surprisingly damp. Like, dripping with water damp. There's condensation on every surface. I think I might have actually trapped too much of the water inside, although it's hard to say at this point. There's a little fungal growth visible as small white spots (this appeared a few days in), but not much.